The different feathers found on waterfowl and are used in bedding. The type of waterfowl feathers. The country the down and feathers comes from. The types of feathers highlighted in blue are those commonly used in down bedding. The pictures are of feathers taken from Pacific Coast down bedding. DOWN feathers are 3 dimensional fluffy clusters that lie under the contour feathers closest to the bird to provide insulation and warmth. Down clusters have a quill point rather than a poky quill shaft. SEMI PLUME feathers are a cross between a down and contour feather. They are slightly more structured than down. 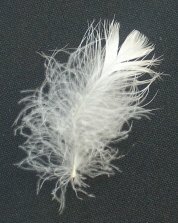 These “inbetween” feathers are used in combination with down for added insulation in down bedding and garments. CONTOUR feathers cover most of the body. They are structured and give a bird its shape. They lay against the body and vary in size anywhere from very small to quite large. The smallest contour feathers are used in combination with down to add support and structure in down bedding. The largest contour feathers are the flight feathers which streamline the body and increase the flight efficiency. Other contour feathers are: tail feathers, the primaries and the secondaries found on the wings. BRISTLE/EYELASH feathers are the short stiffly feathers found around the beak, nares, and eyes of many birds like our eyelashes, facial and nasal hairs. FILO PLUME feathers are the hair-like feathers like those left on a plucked chicken. Which Type Of Feathers Will You Rest On? It all depends on your budget, your needs, and your personal tastes. Duck down is an economical way to experience down bedding– with the exception of Eiderdowns duck bedding – duck down clusters are smaller and thinner therefore less insulating. An unpleasant odor has been associated with low grade duck down and feathers but this has not been my experience with Pacific Coast duck pillows. Goose down produces superior warmth and loft for a fluffier, cozier, and luxurious look and feel to bedding because the down clusters are larger and more insulating. There is no difference in the performance of white or Grey Goose down. Only the color changes. White down is marketed as more desirable and is often the case because the color of brown or grey goose down will show through the fabric of the bedding. White goose down gives a cleaner more sleek look to the bedding and the price reflects this preference. Not all feathers and down are processed equally but compared to synthetics they fall nothing short of delightful. Lower grade downs may appear to be a great bargain but you should be wary of anything that sounds to good to be true. Europe: Down from Poland and Hungry are evaluated as high grade and have a history producing mature down. Canada: Has medium to high grade downs and are know for the high quality Hutterite goose down. USA: Produce lower grade duck down and some Hutterite down in North Dakota. Orient: Lower to medium grades of younger down. Siberia: Siberian down is a myth. The Siberian Goose (aka Red Breasted Goose) is an endangered species and protected by international treaty. A major supplier of "Siberian Down" freely admitted to the Down Association of Canada that the term "Siberian" is nothing more than a trade name. Caution is suggested when dealing with a company that uses misleading branding. Return from this Types of Feathers page to the Down Bedding Delights home page.